Soft sun kissed skin and glittering gold-foiled lips were the look created by Shiseido's elite Tokyo-based team lead by Miyako Okamoto for the Son Jung Wan Fall 2014 collection. Admittedly this isn't the easiest for a DIY/Get the Look project as the talented Shiseido gurus were painstakingly applying and adjusting the lip foils for quite some time backstage. But whether or not we're planning on rocking this look at home, it was fascinating to watch. 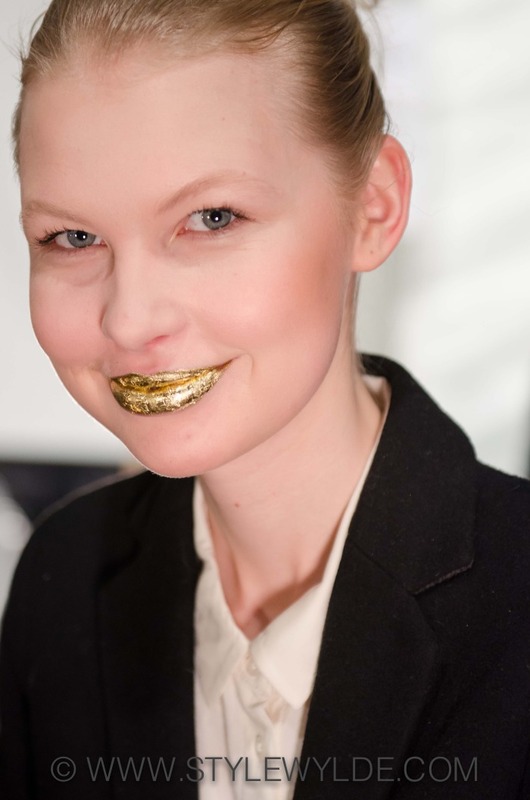 While that was going on, the Prive Salon team was creating a gently tossled bun, and nails were painted in a glittering gold hue to match the lips. For more from the Son Jung Wan Fall 2014 collection, check out the full runway recap from the show here.